The Linux-based operating system MeeGo might soon get a great vitamin boost in the form of ACL, a software solution from a company called OpenMobile. 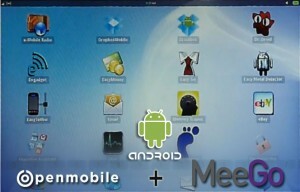 ACL, that stands for Application Compatibility Layer, allows users to run Android applications seamlessly on MeeGo. The applications are installed alongside native applications, and once installed it’s hard to tell the difference between native MeeGo, and Android applications. The applications will run in full-screen mode, just as they would on a Tablet or an Android phone. For the first time it’s now possible to use a smartphone as part of a portable brain scanner that lets you monitor your neural signals on the go, New Scientist reports. 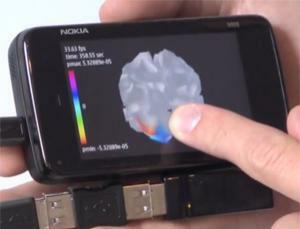 By connecting a commercially available EEG headset to a Nokia N900 smartphone, Jakob Eg Larsen and his colleagues at the Technical University of Denmark have managed to create a completely portable system. Wearing the headset and starting up the application, creates a simplified 3D model of the brain that lights up as brainwaves are detected. This is the first time a smartphone has been used to power the EEG headset. The headset monitors the electrical activity of the brain and is normally intended to connect via USB to a USB receiver plugged into a PC. 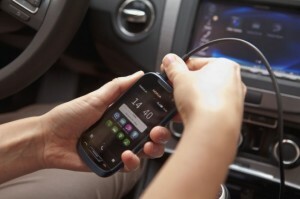 Nokia continue adding support for new technology and standards in their mobile phones and now also adding support for MirrorLink with their latest Nokia Car Mode application. Nokia Car Mode makes it easier for drivers and passengers to access maps, satellite navigation (provided by Nokia Drive), traffic updates, music and voice calls when they are in vehicles, so there’s no need for a separate music player or satnav. All the smartphone features and services are designed and to optimise the usability in the car and avoid driver distraction. The application is written in Qt and will first be available for the Nokia 600, Nokia 700, Nokia 701, but also earlier smartphones once they get upgraded to Symbian Belle. Nokia Car Mode will also be available for Nokia N9. MirrorLink™ (previously known as Terminal Mode) has been developed with the objective to provide a technology, which will offer seamless connectivity between a smartphone and the in-vehicle infotainment system.